A lot of the questions of policy-making for environmental conservation involve uncertainty on how a resource will respond to treatments aimed at making it healthier. Policy-makers are often hesitant to spend money on environmental projects with uncertain outcomes. Yet almost all environmental restorations require them to do just that. The Comprehensive Everglads Restoration (CERP) is the so-called “largest environmental restoration in the world,” and is slated to take over 30 years and cost around 8 billion dollars (both figures are on the rise however as time goes by). 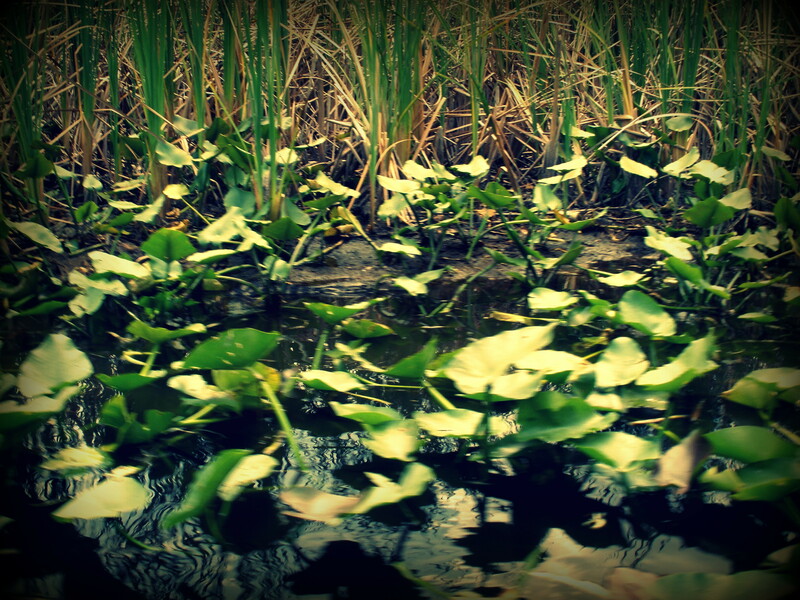 CERP is a last ditch effort to save the Florida Everglades from after over 100 years of drainage, partitioning, pollution, and degradation; it is truly an ecosystem on the brink. CERP is sort of like a puzzle, where many small projects of restoration, when assembled as one unit, will eventually stitch together a healthier state of the ecosystem. The desired state of the Everglades should be a restored “historical hydrological flow” to the system, that existed prior to the drainage and canal-building that characterized the last 100 years. 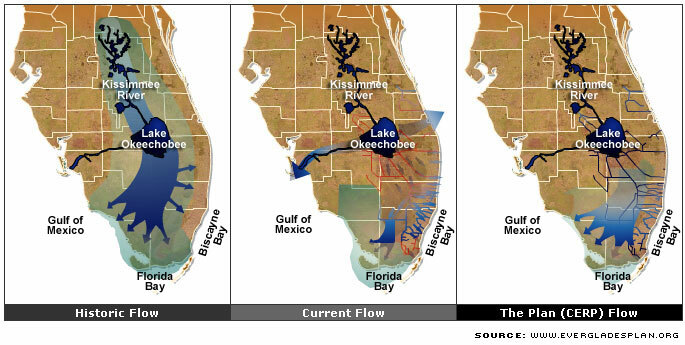 This historical hydrological flow starts in lake okeechobee and ends at the far Southern tip of Florida, taking about one year from beginning to end. This flow pattern at one point covered the entire southern part of the Florida Peninsula, and was basically a very shallow, slow-moving river (first written about my Marjory Stoneman Douglass as the “River of Grass”). This wide, shallow, slow-moving river filters pollutants from drinking water, holds large amounts of water after large hurricanes, harbors countless populations of threatened and endangered species. It is a mosaic landscape with habitats ranging from tree islands, to swamps, forests, and prairies. The major questions and problems in CERP arise when scientists cannot predict with absolute accuracy if certain policies and expenditures of funds, will eventually lead to the desired whole. Will the puzzle pieces fit together in the end, and restore this ecosystem in need of rapid action? These questions bring us back to the main topic of this article: uncertainty. Questions of uncertainty in environmental policy tend to peel back the layers of debates surrounding the philosophy of science, debates outside the scope of this blog. Tangled-up questions arise, such as “what counts as reliable information?” “how do we know what we know?” “how can we create environmental policy when the information we have is not predictive with absolute certainty?” and so on and so on. These questions can delay much-needed policies to restore the environment. Buzz Holling’s groundbreaking 1978 piece on adaptive management is a good place to start. In his piece which focuses on ecosystems, he tackles the myth that sound environmental policy cannot be made without 100% certainty of what is yet to come. He speaks of “living dangerously” versus “living safely.” Going back to the Everglades example, Floridians lived dangerously from the early 1900’s onward when we drained the glades and chopped it to pieces in the name of development, suburban homes, and agriculture. Fast forward to the present day; characterized by delay after delay on CERP projects, with uncertainty used to excuse the delay. It is easy for us to live dangerously for development, but we do not do the same for risky restoration treatments that could spell major payoff. An example of such a treatment is allowing greater quantities of water to flow through the system, many scientists argue this is key to restoring the glades. Adaptive management says we should try it (since it’s our best guess), monitor it, look at the data, and change if it isn’t doing what we thought it did. Adaptive management emphases on learning as a way to reduce uncertainty through action, instead of sitting on our hands and doing nothing. This means going ahead with projects with the best science available, monitoring their results, seeing if they produce intended consequences, then either changing direction, or continuing forward. He asserts quite rightly that man has always lived in an absolute sea of uncertainty, and that we have always cracked on utilizing trial and error. So that everyone involved can learn about what treatments do, and decide on what to do next, Holling proposes workshops. These are short periods of intense interaction, where all voices can be heard, and where next steps can be agreed upon. Stakeholders present at these meetings would include fishermen, Miccosukee Indians, the Everglades Coalition of environmental groups, the sugar industry, agricultural interests, politicians looking to increase development and enhance economic opportunity in their districts. The list goes on and on. In between these workshops, monitoring is carried out, models are refined, and projects continue as planned. Workshops are so that information can be shared, and that gap between scientists, politicians, and stakeholders can be bridged in a systematic way. Stakeholders coming together to learn increases opportunities to reach consensus on what should be done in a restoration. Unfortunately with CERP, these learning workshops are not as consistent as the should be, and data is not used to learn the way adaptive management would plan. My own research for my MSc at Oxford actually found that stakeholders are rarely if ever engaged in decision-making for projects. I also found that many stakeholders have declared the adaptive management component of CERP to be in name only, and a complete farce. I found that here and there certain individual CERP projects such as the Picayune Strand are being managed adaptively, but it is not a coherent approach to managing the whole system. Those same projects are also largely funded and staffed by independent NGOs focused on this one stretch of a large and complex ecosystem. For one of the most frequently cited examples of adaptive management, I found a true paucity of adaptive components in this restoration. This entry was posted in Ecological Restorations and tagged adaptive management, CERP, Everglades, Holling, scientific uncertainty. Bookmark the permalink.